Maryland stands on the brink of becoming the 18th state in the country to abolish the death penalty. We need to show the General Assembly and Senate President Mike Miller that there is overwhelming support for this bill from the citizens of Maryland. Please join us in demanding that the Maryland General Assembly support the repeal of the death penalty. Here's the letter we'll send to Maryland Senate President Mike Miller and the Maryland General Assembly on your behalf. You can add a personal comment using the box to the right. You have an opportunity to show leadership and help to repeal the death penalty in the State of Maryland. In 10 of the last 12 General Assembly sessions bills have been introduced to repeal the death penalty but have not made it to a full vote. You have the power to make sure the bill reaches the floor. For many years, reports from around the country have found that a pervasive racial prejudice in the application of the death penalty exists at both the state and federal levels. As a result, a growing number of states have voted to repeal death penalty statutes. 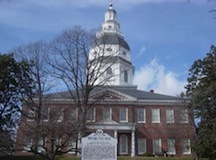 The Maryland Senate repeatedly brought up that there are far too many inequalities within the system to avoid the possibility of killing innocent people. If the bill passes, Maryland would become the 18th state in the country without a death penalty statute. Additionally, in the past five years alone, six states have voted to repeal the death penalty because it cannot be fairly administered — New York, New Jersey, New Mexico, Illinois and Connecticut. Oregon’s governor declared a moratorium on executions last fall. Montana has similarly moved closer to a repeal. It is time to wipe this archaic statute from the books. Please work to ensure the passage of this bill and join the growing call across the nation for a repeal of the death penalty. Click the red button below to have the letter to the left signed in your name. If you'd like to leave an additional comment, you can do so below as well.